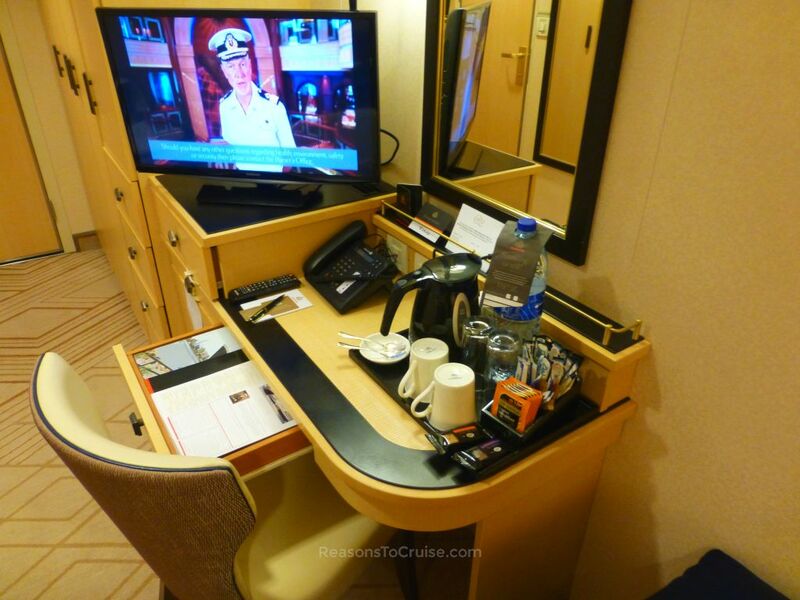 I booked a budget no-frills cabin on Queen Mary 2 and got just that. My travel agent tried to up-sell me a bigger, more comfortable cabin. On such a short cruise, there was no need for anything other than an Interior Guarantee cabin, randomly allocated by Cunard. 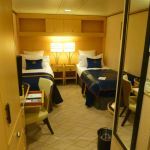 Cabin 6201 sits on the starboard side of Deck 6 in the mid-aft of the ship. It sits next to staircase C and the bank of lifts there, making it easy to get anywhere on the ship without needing a short hike just to head up or down. The cabin is an inside cabin, meaning it has no windows and therefore does not benefit from any natural light. As inside cabins go, this one is fairly standard although the décor makes it feel like some effort went into styling these cabins in line with the nostalgic feel of Queen Mary 2. 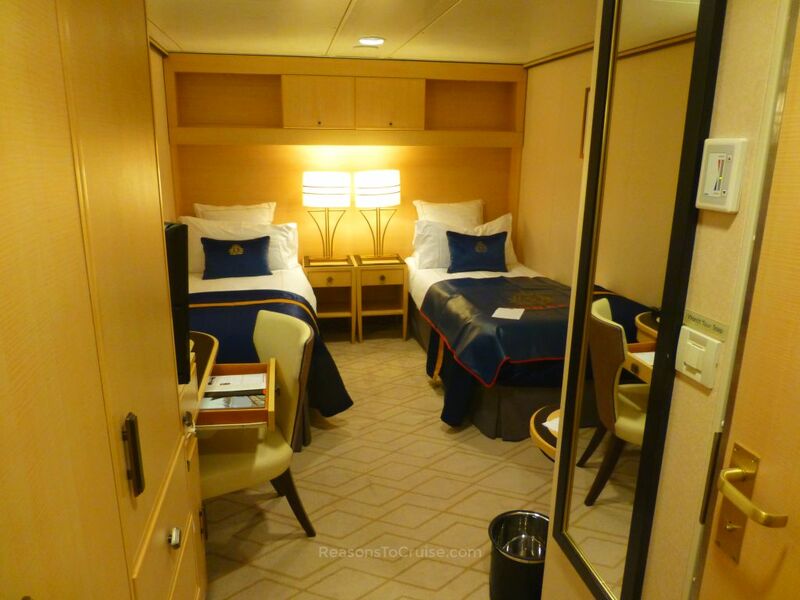 Twin single beds occupy a good chunk of the floor space, with two Pullman beds that lower from the ceiling to provide an additional two berths. Technically you could cram a family of four into this space, although it would not be pretty. To the left of the entrance are the large storage wardrobes. Some of the cupboard space is taken up with the life jackets and safe. 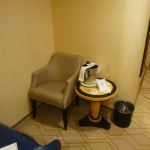 A desk, TV, tea and coffee making facilities, and a minibar sits next to the wardrobe. 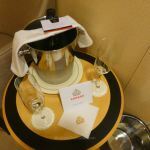 Parents beware: the mini bar is not lockable, and my cabin steward refused to empty it. If like me, you are travelling will kids, this is something to bear in mind in case curious hands go wandering. A tub chair and small glass table tuck behind the bathroom space which is opposite the wardrobe. 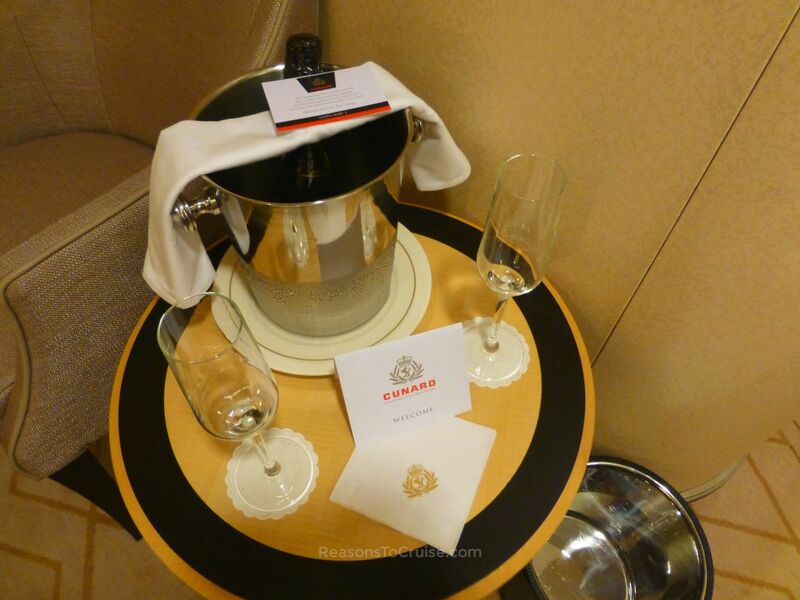 Upon arrival, a half-bottle of sparkling white wine awaited. 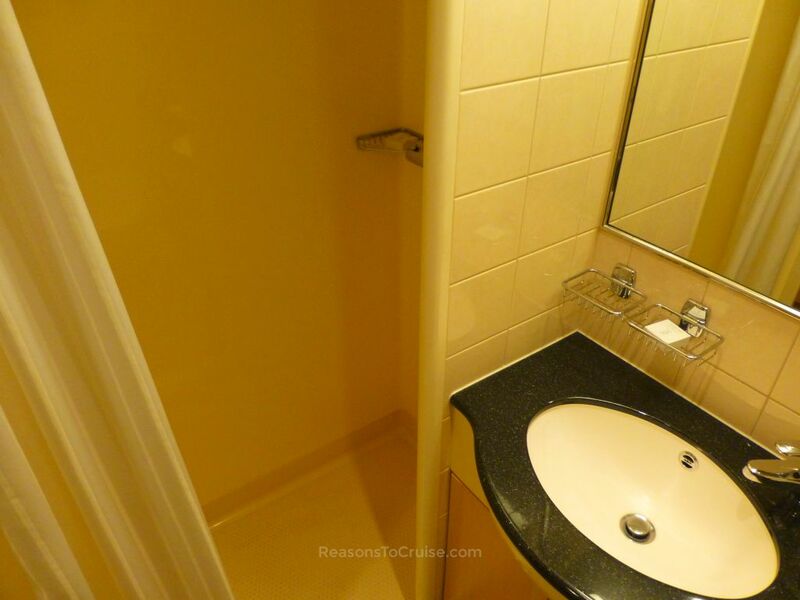 The bathroom itself is fairly basic. 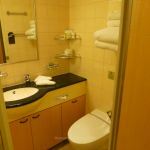 A worn shower curtain masks off the cubicle, with a good size vanity sink area and a toilet occupying the remainder of the space. There is a small amount of shelf space which is adequate if you travel light. 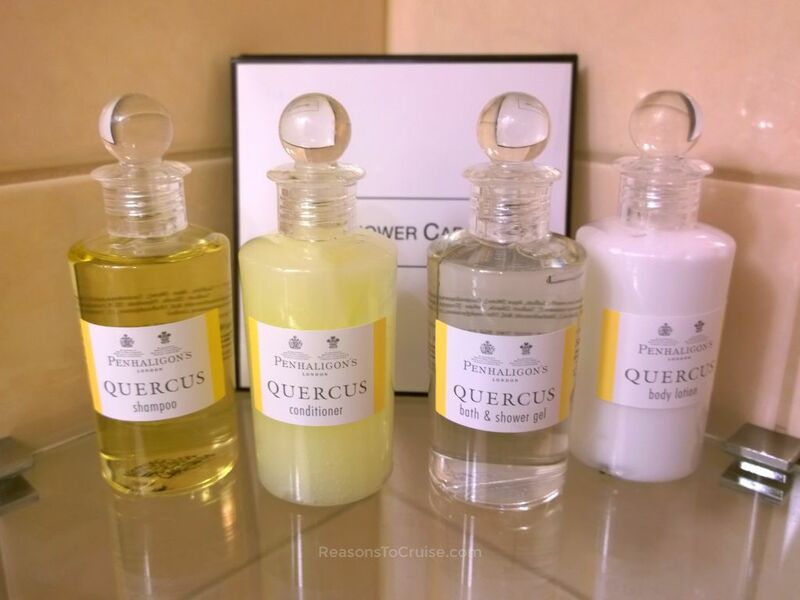 50ml bottles of Quercus by Penhaligon's were in the cabin on the first night, replaced with 100ml bottles on the second. 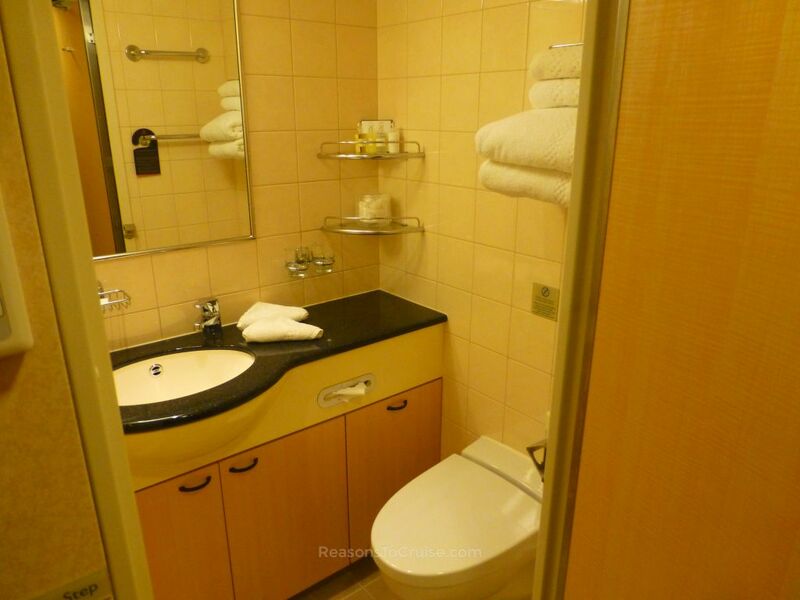 While small, the cabin (and bathroom) is well laid out to maximise floor space. It is ideal for couples, adequate for a trio, and looks to be a squeeze for a family of four. Lots of cupboard space meant I could hide my suitcase during the cruise, keeping the floor clear. 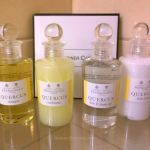 Complimentary bottles of Quercus by Penhaligon's shampoo, conditioner, shower gel, and body lotion saves slightly on packing. A half-bottle of sparkling white is a lovely gesture although it would be great to express a preference on beverage choice. The option to choose a non-alcoholic alternative if you travel with children would be a nice touch. Small packets of biscuits replenished daily and nightly Godiva pillow chocolates are tasty extra touches. The service from my stateroom attendant was excellent. 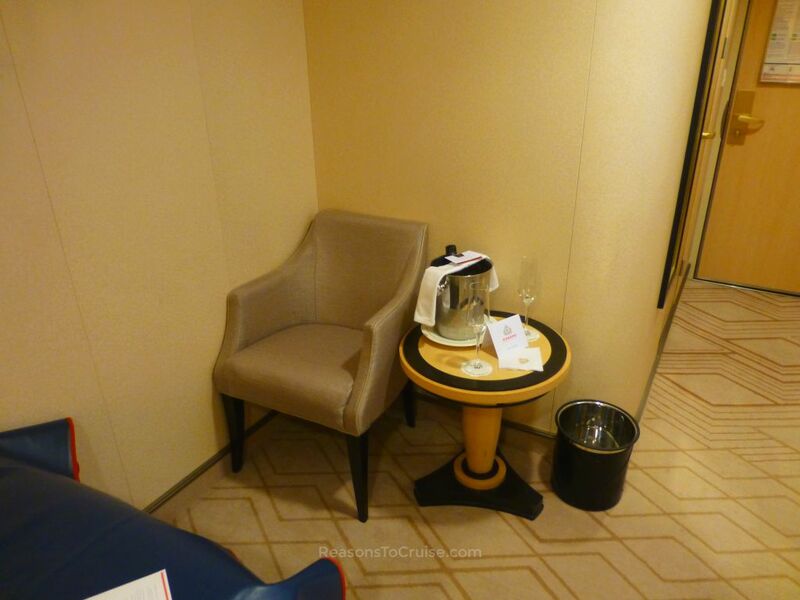 While the cabin was haphazardly prepared, my attendant took care in her work during the short cruise. The cabin appeared to have been hastily prepared, with rubbish left in the wardrobe, and a strong smell of urine from previous occupants in the bathroom. The lack of a window means this room feels more oppressive than an Outside or Balcony cabin. 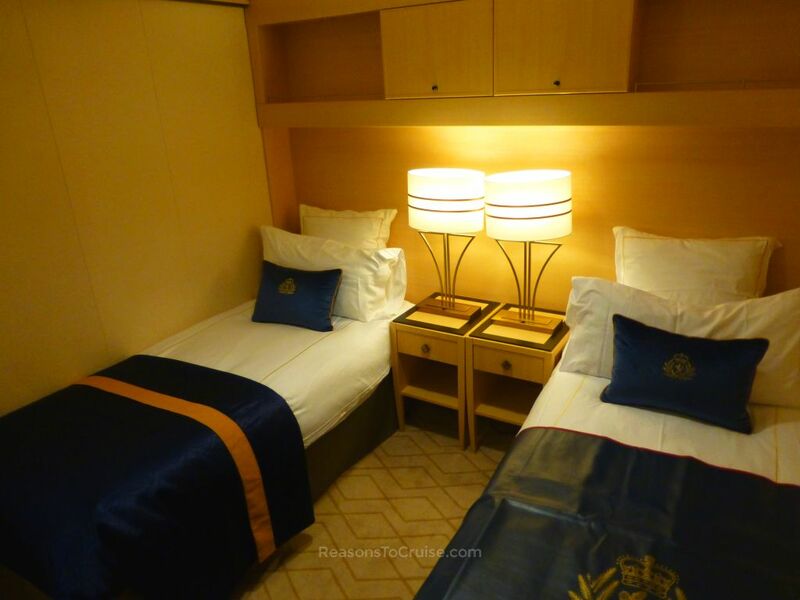 Better, more modern lighting might help in making the cabin feel less dingy. Travelling solo? 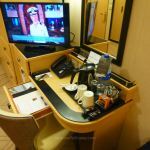 If you plan to sail aboard Queen Mary 2 on your own, consider booking a Britannia Single Outside Cabin instead. This grade really is something special. 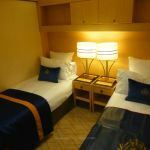 Would you stay in an inside cabin on Queen Mary 2, or would you prefer to upgrade to a better grade? Share your thoughts in the comments section below. A budget and compact cabin it might be, but it still came with half a bottle of wine, bottles of toiletries, and excellent attention from my stateroom attendant. For such a short cruise it was ideal.